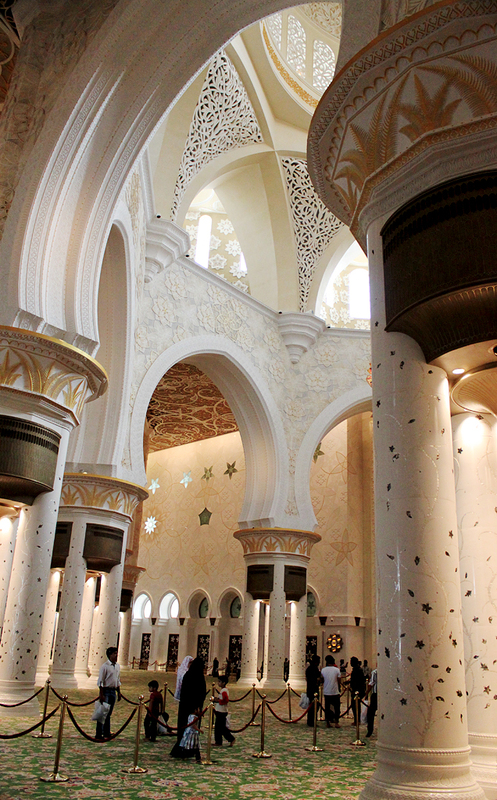 ← Previous: Ibrahim Project, June 7: Last thoughts in Oman & first thoughts in the U.A.E. As the proverb goes, all that glitters is not gold; the oil wealth of the U.A.E. has led to what Mark calls a “facade of modernization” that is purely physical. He said the country always has economic growth plans, but not political ones, pointing out that there’s still hardly any suffrage, but rather “selective participation” for the country’s residents. Only 15% of the U.A.E.’s population is actually composed of Emiratis, as the country is overwhelmingly populated by foreign nationals. Mark also noted that non-nationals are what make the U.A.E.’s economy run and thrive, yet these migrant workers are essentially indentured servants. I would clarify that there are many expatriates from developed countries who do quite well in the Emirates—it’s those from poorer places like South Asia (whose emigrants actually make up half of the U.A.E. population) and East Asia who are exploited in huge numbers and become stuck in intolerable circumstances. Mark claimed that U.S. interests are generally shifting from Israel more toward the Gulf. He mentioned a few important elements to consider. First, of course, is religion, which is extremely important to the region. Second is what he called a “clash of civilizations”—not between the West and Islam, but within Islam itself—between sects and nationalities; he claims they are currently having their own Reformation, reminiscent of the historic clash between Protestants and Catholics. Finally, he described what he sees as an emerging “cold war” in the region. American alliances with pro-Western authoritarians posed a dilemma for the U.S. in the Arab Spring’s wake, as we hadn’t identified with religious leaders or the common population. As Mark noted, these dictators may have kept peace with Israel and stayed economically open to the U.S., but they were ultimately “nasty”—anti-Americanism rose as we were blamed for propagating these dictatorships (apparently Oman had been careful not to be “in D.C.’s pocket,” although it was certainly in Britain’s). Generally, these governments “no longer see Washington as reliable,” Mark said. He noted that they are trying loosen their ties to America without being “anti-American;” for example, the Saudi rulers can’t believe how D.C. “cut Mubarak loose,” and want to reposition themselves in leading a new bloc (replacing D.C.). However, there are still tensions between Saudi Arabia and Egypt, which Mark claimed “won’t allow ‘oil-drum feudalism. '” Both countries could be central players in an emerging Sunni movement, especially given the rise of the Muslim Brotherhood (who, he noted, had an advantage over less well-organized secularists when the Egyptian elections took place so quickly). What’s left is a stand-off between the remaining Sunni leaderships—Hamas, Jordan, and the rest of the Gulf—versus the Shi’a and other groups—Iran, Hezbollah, Syria, and, somewhat, Lebanon. He mentioned that Iran has the goal of Middle East hegemony as well; Saudi Arabia, Egypt, and Turkey essentially form a Sunni coalition trying to keep Iran in line. Mark also noted the situation facing the Jordanian king with regard to the majority Palestinian population and the urgent need for a Palestinian state, as well as Jordan’s stance toward Syria—where minorities are rallying around the murderous Assad out of fear that the alternative could be worse. Events in Jordan have escalated significantly since the summer, and Syria tragically continues to be a site of endless bloodshed. After a short trip south to Abu Dhabi, we arrived in Masdar City to have lunch with Gian Vergnetti and explore the Masdar Institute where he was working at the time. Thanks to the Fulbright Program (administered by IIE, just like the Ibrahim Project), Gian was in the city to research its nascent sustainable technology initiative. The Masdar Initiative is a primary component of the Abu Dhabi government’s plan to diversify their economy away from oil and has further emerged as an international platform for the development of renewable energy and sustainable technologies. 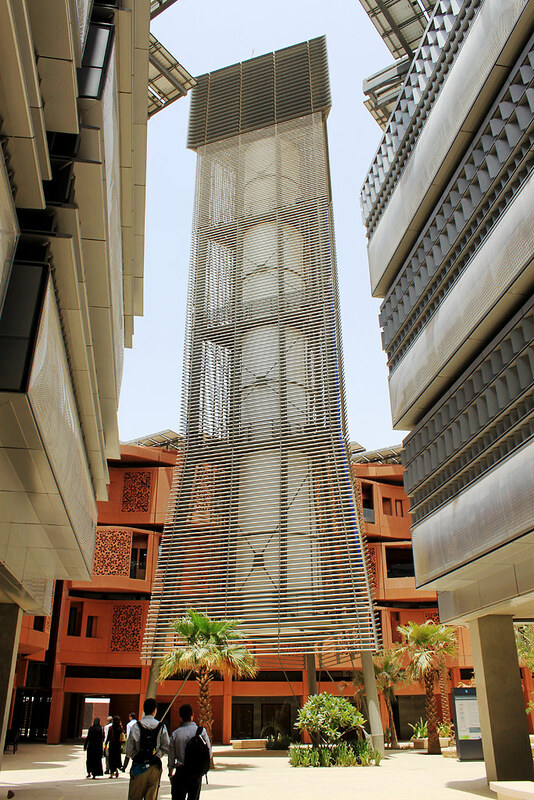 Gian studies the Masdar Insitute’s multifaceted approach, the adaptability and behavior of markets in response to these new technologies, and their economic and societal implications both regionally and globally. He has also researched the environmental impact of trade and urbanization, including the water issues that arise when ships sail. Which reminds me: throughout this trip, the only time I actually felt culture shock was in the Emirates. You’d think that’s something I’d experience in relatively traditional Oman, or in the Jewish state of Israel, or in the occupied West Bank. But I arrived in all of these places expecting to see something different, and to have those expectations confirmed was not shocking. I did expect an extravagance from the U.A.E. that exceeds what I’ve seen in America—however, what I actually saw stretched beyond the limits of my imagination, and I think that’s exactly the kind of place the country tries to be. From the Masdar Institute to the malls, from my hotel to the Burj Khalifa—I was continually amazed at the physical ostentation of the Emirates, a capitalist wonderland, the most shocking culture of all. 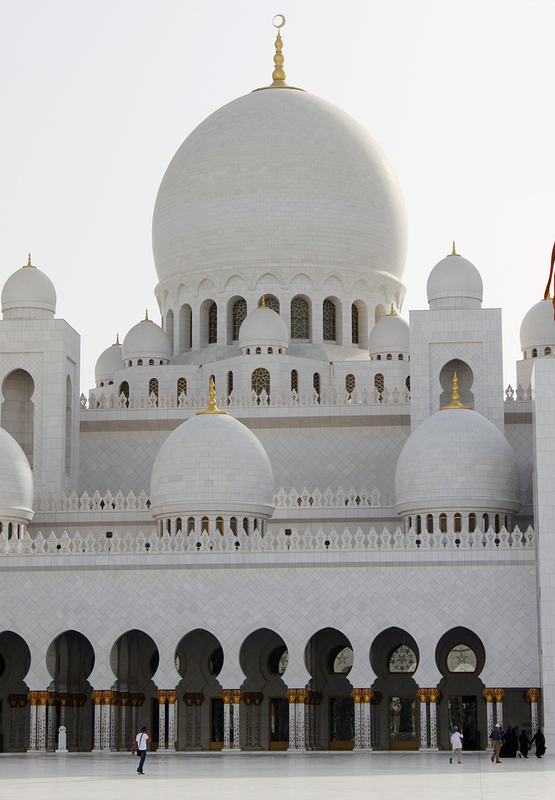 Anyways, Gian’s time living and researching in Abu Dhabi meant he had a lot to say about Emirati culture and society. He told us that you can only attain citizenship if you are born here, and you are granted more privileges if that is the case—explicitly, but also less explicitly, as Emiratis are often treated much better than others. Westerners are also treated especially well, along with other Arabs. Outlining the kind of hierarchy I mentioned along with my initial impressions of the country, Gian added that Southeast Asians, particularly in the service industry, are treated most poorly. This goes along with wealth, as there is much more money at the “top” than the “bottom;” the same applies to living conditions and people’s rights in general. However, in Gian’s view, this isn’t exactly an inflamed conflict—it’s not “eating away at the society,” as the problem hasn’t reached that point yet. He said it’s largely dependent on circumstances—this is a relatively new country, with new wealth—but if the “timeline” of these circumstances is extended, his first remark will no longer be true and conflict will happen. He told us that, when he first came here, he was actively looking for these problems about which he’d been reading, and he found them, but never in the ways he expected. I arrived in the Emirates with the same attitude, and I think I can say that I ultimately left with the same kind of experience. Gian also added that this kind of scenario, the influx of foreign workers and all, is not unique—it occurs with development in China and other developing countries, and even in the U.S. and Europe. However, as Jake G. astutely noted, in no other place do they comprise the majority of the population. Discussing indentured servitude in the Emirates, Gian mentioned how the privileges “we” enjoy in America also come on the backs of cheap labor, centuries of slave labor, and the genocide of natives—all of this only finds “freakish epitomization” in the Emirates. In a gorgeous library overlooking the desert. Apparently there’s currently a kind of “Emiratization” mission: to get natives into the labor force, build human capital, and have more kids to grow the Emirati population—meanwhile, rights and citizenship for non-natives aren’t coming anytime soon. For example, according to Gian, if you’re not Emirati, you won’t get a job for which an Emirati has also applied, even if you are much more qualified. You may work for them or under them, but you’re unlikely to get that job yourself. He described a kind of dissonance in goals here: “How can you be a regional or global hub if you Emiratize everything?” And of course, there’s also the always-important question of whether democracy will ever arrive: “How can you build a New York City or London without democracy?” For the Emirates, money and time are sort of a “lubricant” in this matter. There’s also a notable difference between common stereotypes of the natives and Gian’s own perceptions. 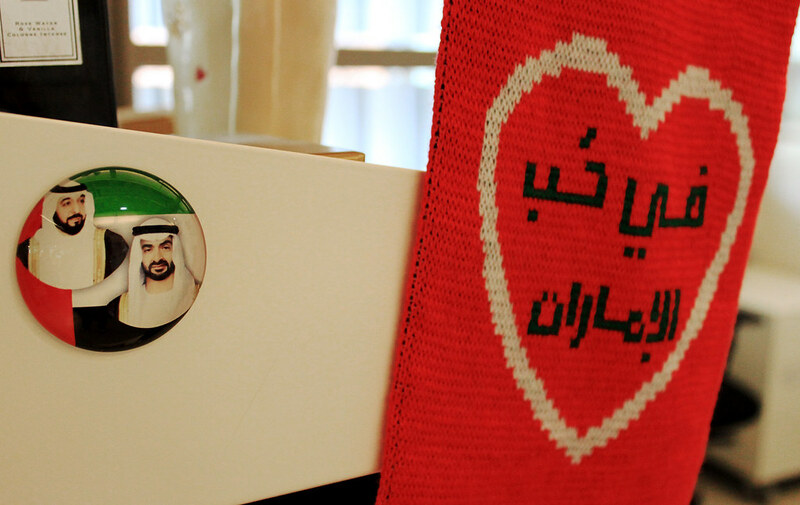 For Emiratis, there’s generally a strong, ingrained sense to remember who you are and where you came from—this comes largely from the founder of the country, Sheikh Zayed, and from Islam. There’s this theme of “coming from nothing”—a developmental miracle, a blessing from God for which they should be grateful. They are proud of their culture, but they are also thankful. On a personal level, Gian has found that the Emiratis are friendly and tolerant, not hot-tempered—he’s never seen anyone in an argument. It’ll be interesting to compare this expatriate perspective to a native’s perspective in the next post, which covers our day in Dubai. We asked Gian if he’s sensed any conflict or cultural dissonance between the U.A.E.’s visible materialism and still-valued Islam. He said he knows many Muslims here who drink and engage in activity that most Muslims don’t—at least half don’t partake in this kind of behavior, and they know others who do, but generally aren’t going to force anyone to act differently. There’s a fair representation of religious Muslims, especially at the Masdar Institute where there are many Middle Eastern students. He said the academic community here actually is now studying whether you need to be less faithful or religious to compete economically. It’s currently an experiment in progress, and no one really knows how to replicate it. 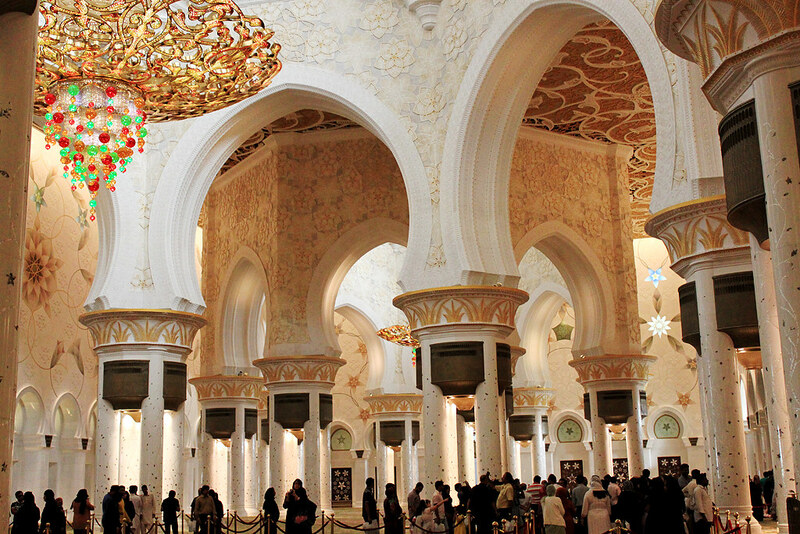 As for his own experience living in Abu Dhabi, Gian has found that you eventually “surrender” to the culture and its rules—you just stop thinking about them after a while. He says his visitors often question a lot of things and ask why they are a certain way, but he himself doesn’t really notice anymore, and tells people that this is just a different country—and he’s really used to living here. Gian actually returned to the U.S. a few months after we met him, but during our time together he said that he would consider returning to live in the Emirates. He’s enticed by various things: the newness, building the economy, seeing the payoff right before your eyes and being a part of that; but also, he appreciates the variety of cultures and differing dynamics, as he claimed that “the U.S. is monochromatic by comparison.” He said he was blown away when he first arrived, as there is a diversity of a different kind—to him, the Emirates are not just a Westernized East, but bring together East and West. One other comment: we asked Gian about views of Iran in the Emirates, given that the U.S. wants to protect the Gulf region from Iran’s influence. He said that people do talk about it here, but not very much or overwhelmingly. I really enjoyed our conversation with Gian and all he had to say about the social dynamics of the U.A.E., but I’m now more curious about how these connect to more explicitly political issues. 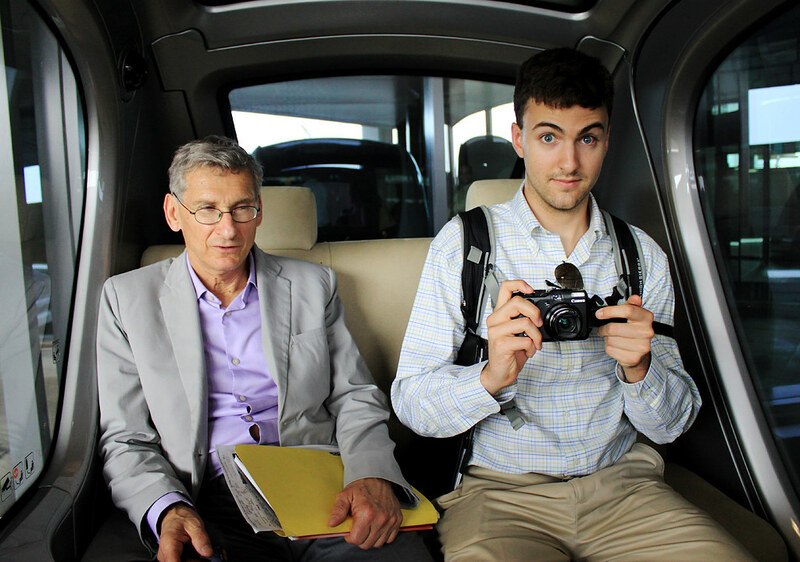 A “Personal Rapid Transit” vehicle: basically a self-driving car, which we had the opportunity to try out. 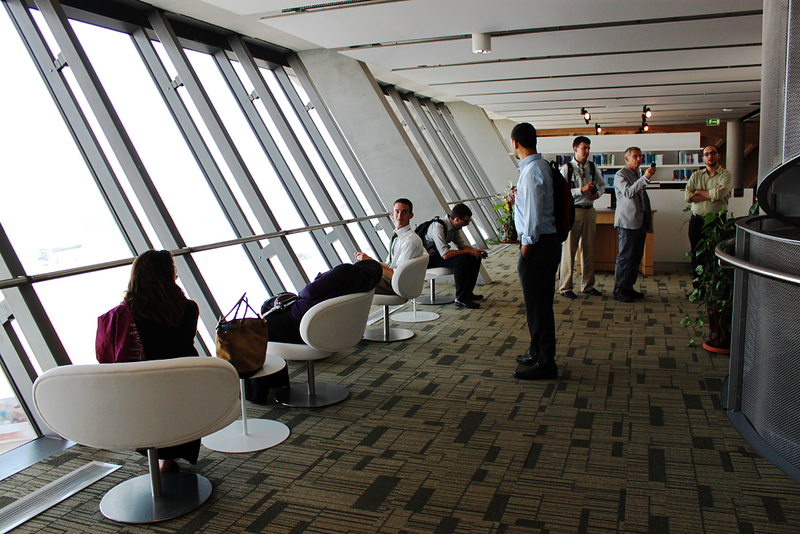 After lunch, we headed into the Masdar complex to check out all of the incredible things that they were doing. And that’s really the only way I can describe it – incredible. 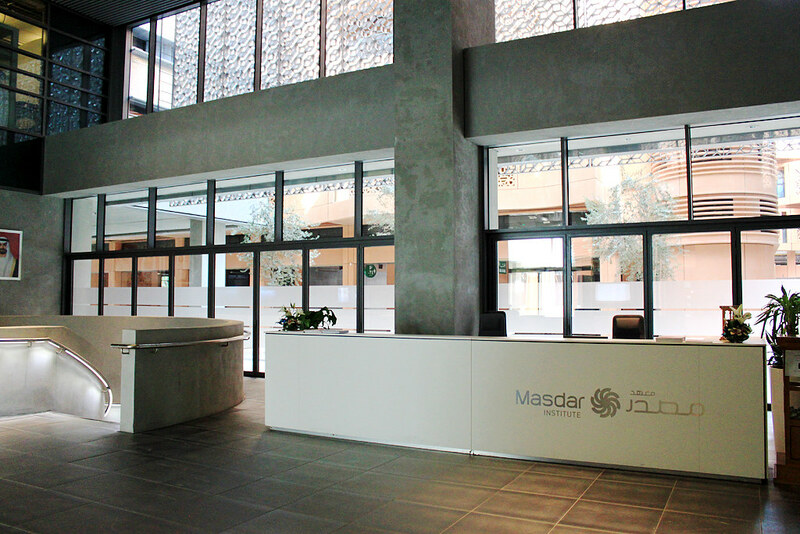 It’s hard to believe that the entire Masdar project was only started in 2006. 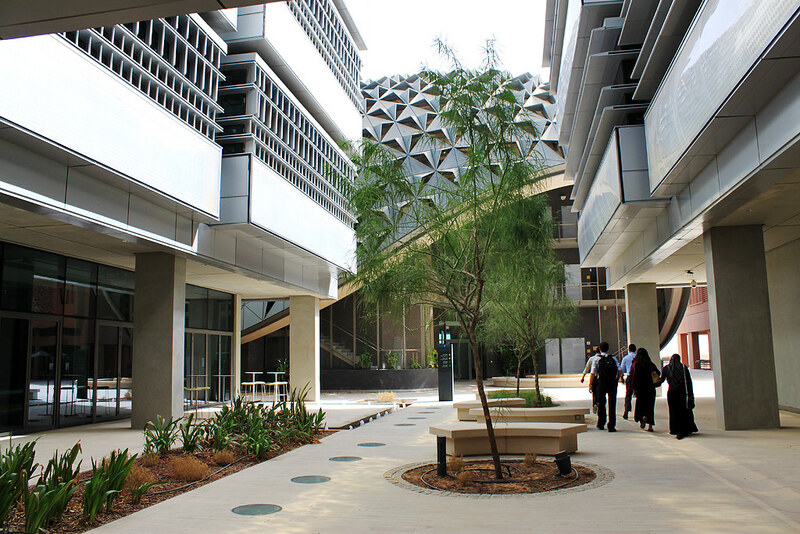 In six years, Masdar has created a new world in Masdar City surrounding sustainable living and energy research with academic, commercial, and residential interests. The idea behind the entire project was to make a destination that people want to experience and live in. And that’s exactly what Masdar has accomplished, in my opinion, because it is easily one of the coolest things I’ve ever seen. Gian showed us all around the campus and we were all wowed by the brand new classrooms and laboratories (in which Mark felt the need to pull every single lever – I swear he almost activated the emergency shower on himself). We got a chance to see all of the amazing research projects they’re working on for sustainable energy in a variety of fields from mechanical engineering to economic and business development. They are clearly doing important, impactful research at Masdar, and it was absolutely fantastic to get to experience first hand the things that they were working on. Not to mention the physical sight of the whole campus. If the exterior architecture of all the buildings wasn’t interesting enough, the amazing, futuristic interior of the building was awesome. The Knowledge Center (a fancy way for saying the “library”) has a double helix shaped spiral staircase; it was like a science nerd’s dream come true! 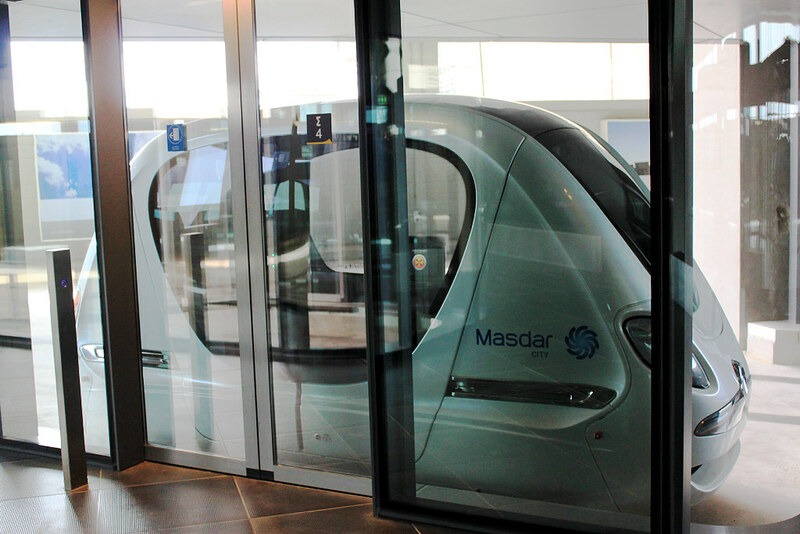 But by far the coolest part of our visit to the Masdar was getting a chance to ride in their Personal Rapid Transit system. Imagine a small pod with nothing but four seats and a computer screen that at the touch of the button will drive you to the destination of your choice. 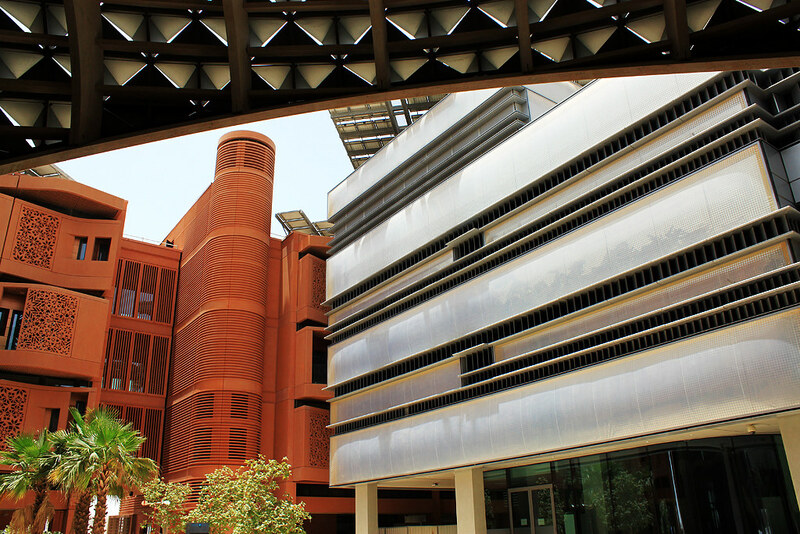 The PRT system at Masdar City currently only runs between two spots: one of the main parking lots and the main building at the institute. These driverless cars follow magnetic paint in the ground and so do not need a driver to direct them. They just take you to your destination, giving you time to relax a long the way with some friends. The idea behind the PRT is that it eventually will be a sustainable (and frankly, more enjoyable) alternative to public transportation. The pods get recharged at their home stations and don’t require any gas. They were also just SO much fun to ride around in. I felt like I was in the middle of some futuristic society or Star Wars again, but this is just one example of the amazing things that make up life at Masdar. Mark and Jake G. inside a Personal Rapid Transit vehicle. I think Jake’s reference to Star Wars makes clear why it was the Emirates, of all places, where I felt culture shock. I’ve scattered this post with some photos of the Institute, but there are many more available here at my Flickr page. Thanks again to Rahilla for connecting us to Gian, and to Gian for taking the time to talk and show us around. 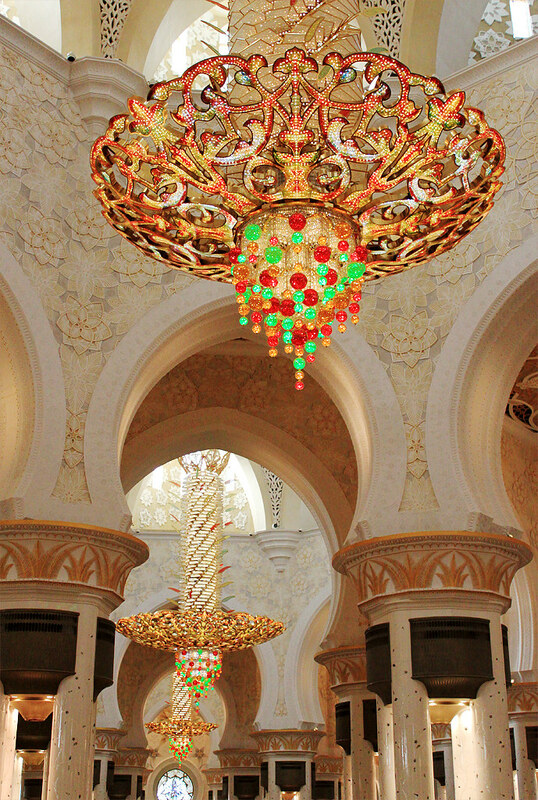 From the Moroccan-style interior and Indian-style exterior architecture to the in-laid colored stones from around the world, stunning Greek marble, gold-capped columns in the shape of palm fronds, and the unbelievable German chandeliers, every single detail was clearly taken into account when building this Mosque to make it as grand, impressive, and beautiful as possible. 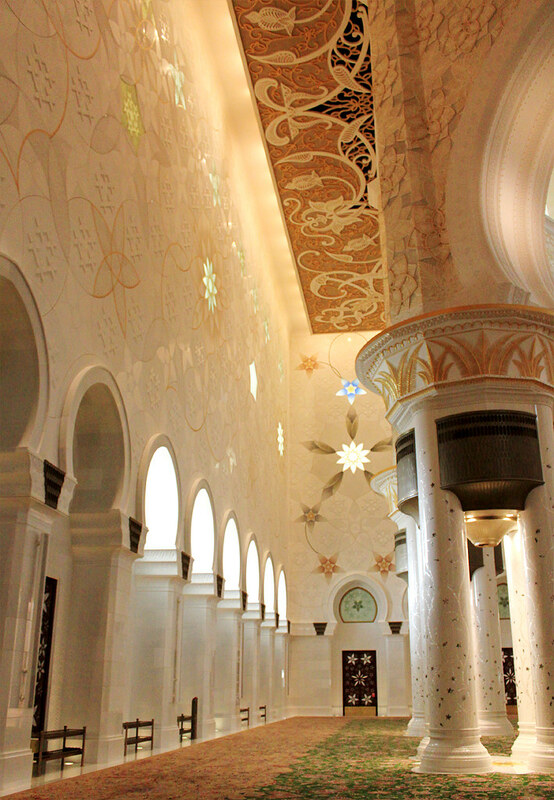 As this description makes clear, the Mosque was built of pieces from all around the world. I’m actually not sure there is anything at this mosque that wasn’t made abroad. This isn’t necessarily a good or bad thing; although it would’ve been nice to have more of an Emirati influence on the architecture, in a way the Mosque appropriately represents its location: an international mosque for an international country. 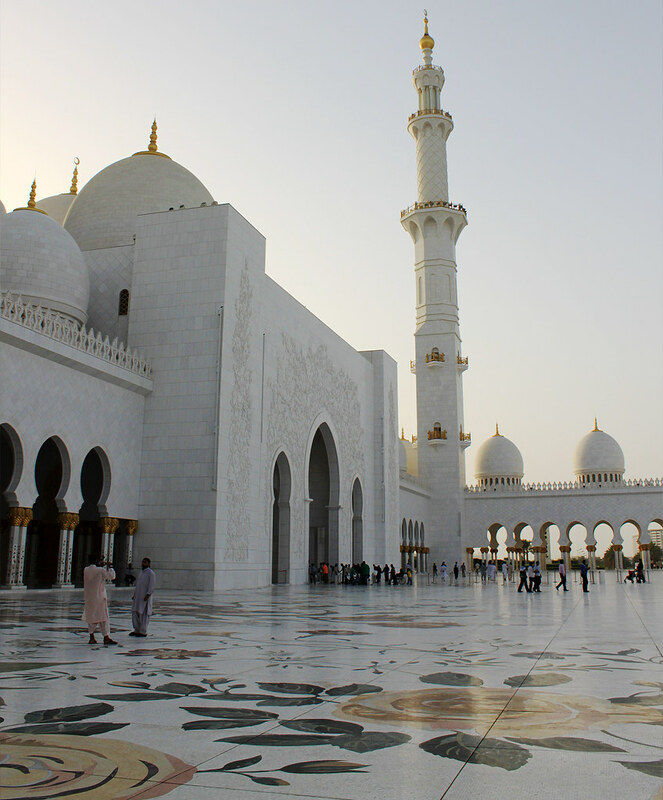 However, in all its grandeur, the Mosque looks more like a palace than a place of worship. It actually didn’t seem at all like a place where one could pray, being a major tourist attraction that is constantly crowded with visitors from all over the world. In this way, it actually felt much too showy and touristy to me and the other students—and not really at all spiritual. I definitely appreciate the magnificent beauty of this landmark, but my heart still leans more toward the Sultan Qaboos Grand Mosque in Oman. 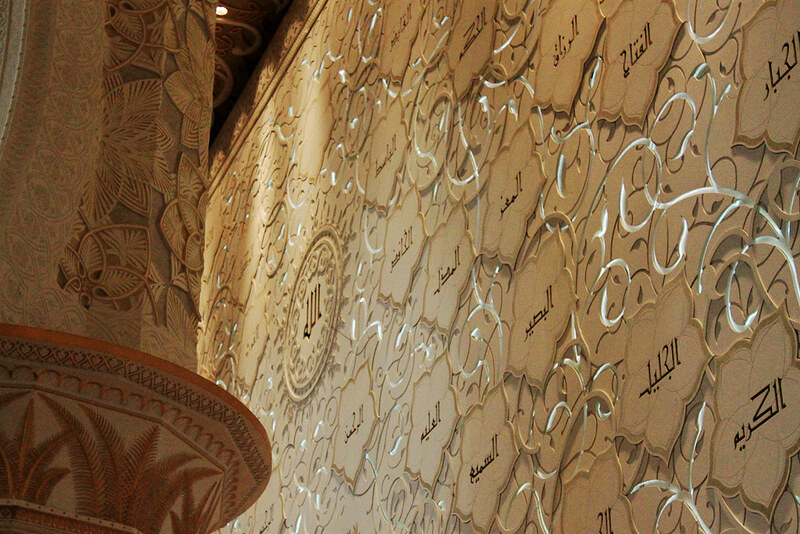 In a particularly beautiful touch, the walls were adorned with the 99 names of Allah. Also, this may sound strange, but upon entering the Mosque I had an experience in line with some things that friends and family told me to expect of Saudi Arabia (when it was still on the itinerary). I was essentially told that even though Westerners are treated well there—for example, in photos of last year’s Ibrahim Project trip to the Kingdom, I noticed that the girls’ abayas only loosely covered their hair, with many strands still visible—my physical appearance could lend me discrimination. In other words, even though I am a Westerner, I am a brown one, and thus in Saudi Arabia I could expect to be treated more like a visiting Muslim from South Asia—i.e. with stricter Islamic expectations. I wasn’t sure how true this would be, especially since I would be in a group at all times, but I did notice something strange while entering the Mosque individually. 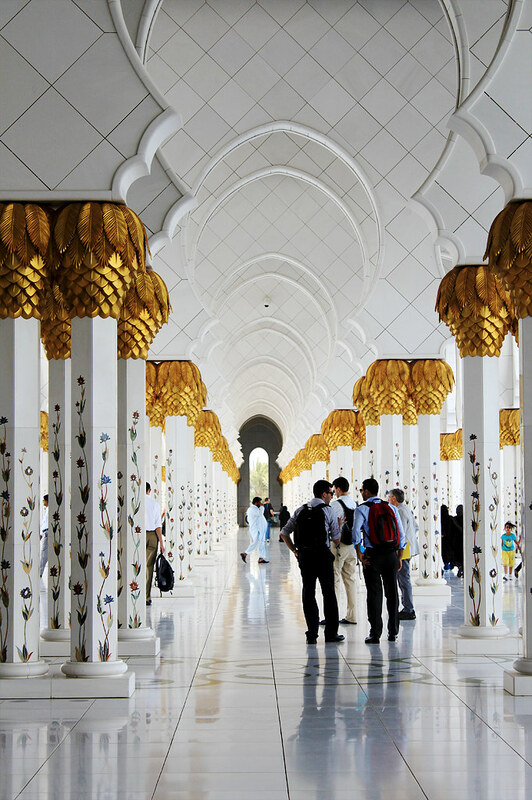 At the Grand Mosque in Abu Dhabi, women were to cover appropriately, but this did not mean abayas for everyone—if already your shirt was long enough, your clothes loose enough, and your head covered enough, you did not need to borrow an abaya. Most women didn’t come dressed for the occasion and had to cover up, but knowing I’d be visiting a mosque I actually purposefully wore a long, loose shirt and brought my own hijab. For some reason, that was not enough, and I was escorted into a changing room where I was given an abaya (a damaged one, at that, which was further frustrating). 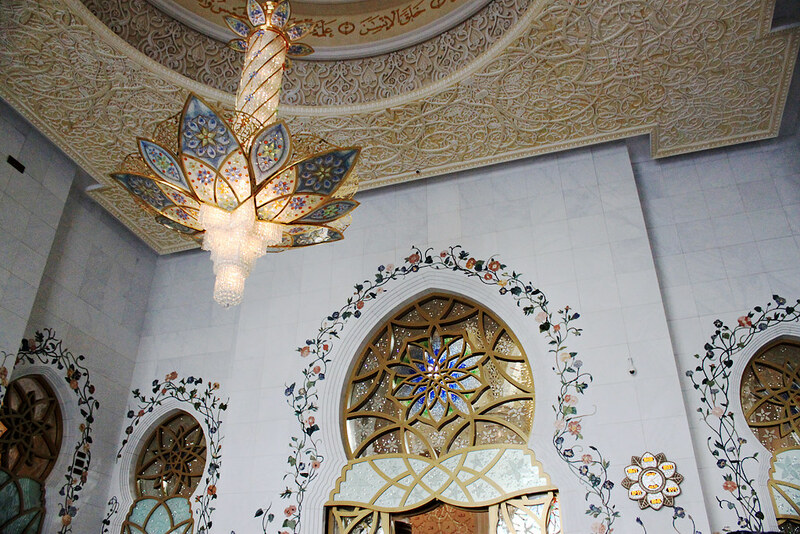 Inside the Mosque, however, I saw white women wearing clothes similar to mine with much looser headscarves, who clearly hadn’t been obligated to cover up further. I’m not someone to whine about having to dress modestly at a mosque, but it was annoying—to say the least—to witness this perceived double standard in how foreigners were treated. Even though I had been told to expect it of Saudi Arabia, and even though I was aware of racism in the U.A.E., I didn’t exactly imagine it manifesting this way. This specific occurrence itself is hardly a problem, but if I’m not being overly sensitive (let me know if you think otherwise) it may be indicative of a mindset implicated in more significant problems. 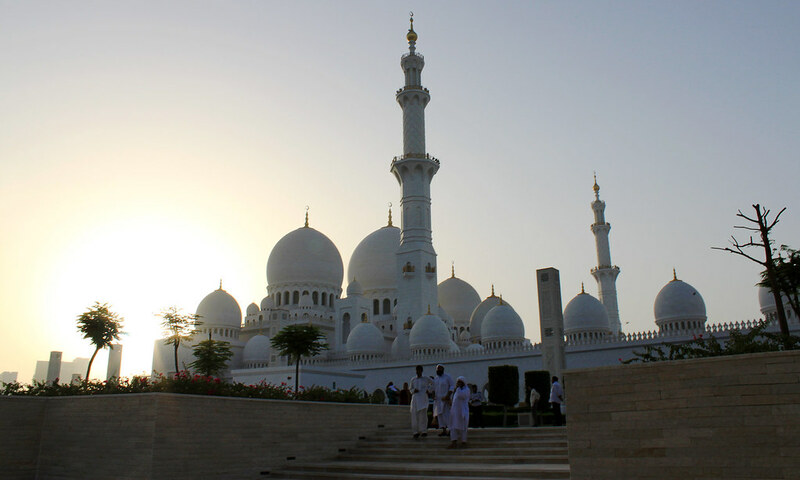 Finally, I have some family living in Abu Dhabi who were actually able to come see me at the Mosque. Because I couldn’t veer too far from our group, I didn’t get to spend too much time with my relatives, but it was nice to see them for the first time in so long, especially in such beautiful surroundings. My grandma has previously lived with them and was able to see the Mosque herself during that time, so when I came home she asked me all about it and happily recalled how beautiful it was. 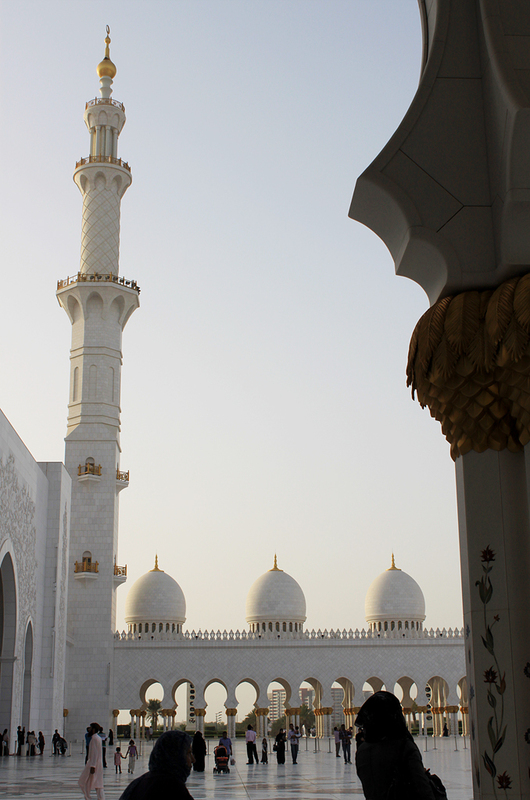 In this post I’ve included only a small subset of the photos I took at the Mosque, but you can view the rest here. We returned to Dubai just in time for dinner and decided to try out the hotel’s award-winning Indian restaurant. Here, we finally sang “Happy Birthday” to Dillon as he was brought another birthday cake for the occasion. I’ve written countless times about how much I enjoyed spending time with this group, but this night was yet another instance of endless laughter and bonding. So much love as the guys mess with the birthday boy. The food was expectedly great, but I especially liked how the restaurant features live music from an Indian band named Santosh and Jyotsna. They performed many famous Indian songs with which I was familiar, but I had quite a moment when they started performing what I immediately realized was my mom’s phone ringtone. I don’t think anyone else in our group found that as cool as I did, but it was one of those moments on this trip where the singularity of the experience really hit me. Afterward, we retreated to our bedrooms to rest up for a packed final day in the Emirates. 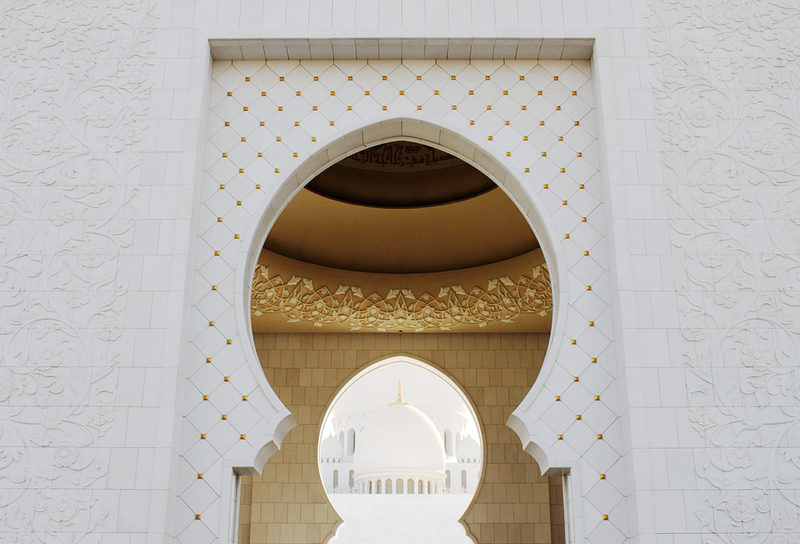 ← Ibrahim Project, June 7: Last thoughts in Oman & first thoughts in the U.A.E.